When you are dealing with an infestation, the thought of having to deal with bed bugs in your car feels like your nightmare is getting bigger, not smaller. 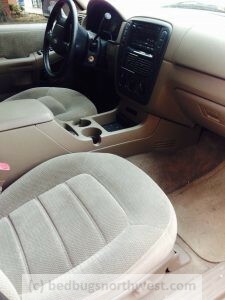 An infestation in your car has even bigger implications like reinfesting your home during treatment, infesting your workplace, friends and family. I know, that was me. 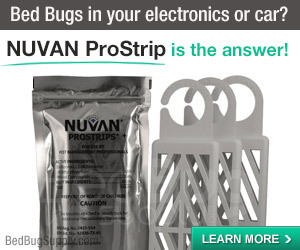 Below I have listed five ways people try to deal with bed bugs in their car that are not certain to kill all bed bugs and eggs, leaving you exactly where you are today, except possibly with more new baby bed bugs in your car. You deserve the truth. I am not going to sugar coat bed bugs for you. And now, how to fail at being sure you’ve killed all bed bugs in your car. I’ve talked about the dangers of using pesticides in your car, and that includes food grade Diatomaceous Earth (DE). For the sake of your safety, I’ll repeat here, do not use foggers, liquid or powdered pesticides in your car. Powder and sprays only work when bed bugs come in direct contact with them. Foggers may or may not come in contact with where bed bugs are hiding but what about bed bug eggs hatching deep in your cars interior? The problem with car detailing is only what is touched is cleaned. It doesn’t penetrate your cars seams and inner spaces. Again, bed bugs will not be roaming around under your floor mats. They will hide and nest in your cars deeper interior under the plastic and upholstery. Detailing will make your car look nice but you may still have bed bugs in it. This might work if your car is in some part of the world right now where they are experiencing temperatures of over 120° and you can be sure that every interior area of the car will be heated to at least 120° for a period of 4-6 hours. It is “possible” this would work, but “possible” isn’t acceptable is it? You want to be absolutely certain you are not going to reinfest your home from your car, so we are not accepting this as a sure thing method for treating your car. I had also considered using a professional auto paint oven to achieve these results and am still curious if this is a viable technique to kill bed bugs in your car. If you’ve been doing your bed bug research you already know bed bugs can live as long as 12 months or more, depending on their last meal and external temperatures. University research has determined that bed bugs live longer without a meal in cooler temperatures than in warm to hot temperatures. Virginia Tech has produced an excellent guide to the bed bug lifecycle here. I solved my vehicle infestation with a combination of renting an auto paint oven for 4 hours and a Nuvan strip for three weeks in my sealed SUV. I left the strip in for three weeks to catch any hatching eggs or newly laid eggs in not yet dead bugs. I rented a car and used the public transit during that time. It turned out to be not too expensive and not that inconvenient. I bet you’re wondering if I ever saw bed bugs in my car during my infestation, and the answer is yes. Unfortunately, I infested my car bringing things I was getting rid of into it without realizing how dangerous that was. I saw bed bugs escaping from the seams in the dashboard, while steaming the car. I quickly realized I would have to find another way to get them out of my car. Understanding the bed bug egg laying cycle helped me plan an effective strategy. You can read more about how to get rid of bed bugs in your car here. Did this article help you find a way to deal with bed bugs in your car? Do you have more questions? Use my contact form to ask a question, if I don’t know the answer I’ll try to point you in the right direction. * Products purchased products through this site don’t cost extra but the site earns a little affiliate change that goes directly to the hosting, updates and renewals to keep it going (since 2010). Thanks for your support, I hope my experience can make yours better. Leave a comment below if you found this post helpful.